Panasonic has decided to hit the global phone market this year. It plans to launch more than ten new phones competing with Indian and Chinese phones, including Panasonic ELUGA A3 Pro, announced in August 2017 and launched in the market. Also in August, the phone comes a little different from the previous Panasonic ELUGA A3. In this review, you will find a detailed explanation of the specifications of the Panasonic ELUGA A3 Pro phone, with the most important features and highlights, and evaluation of the performance of the phone through the assessment of performance specifications, and the end of the review the price of the phone in some Arab countries. The box contains a Panasonic ELUGA A3 Pro phone in one color, with a separate phone battery, a screen protector, charger, cable, earphones, a slide-out section, a manual for operating and operating the phone, and a warranty card. The Panasonic ELUGA A3 Pro comes in a very sleek design, the most important feature of which is the strength of the material . It is made entirely of metal with a light weight of 161 grams and 148.7 x 72.4 x 9.4 millimeters. It is light and its size is suitable for one-hand holding for a long time. On the back of the phone is the rear camera in the middle of the upper part with a flash LED on it, and in the middle of the back is the company logo with the ELUGA phone logo on the bottom and the bottom of the external phone speakers. On the right side of the phone are the volume control buttons, the bottom of the screen, and the left side of the phone. At the top of the phone is the 3.5 mm earphone jack, and below is a USB port for the charger or file transfer connections. The phone supports second-generation GSM coverage, 3G with UMTS coverage, and 4G with VoLTE coverage. Two SIM cards can be used in the standby mode, or one SIM card when using an external memory card. The 5.2-inch IPS LCD screen supports multitouch, supports 16.7 million colour display colours, 1280 x 720 pixels HD resolution, 282 ppi screen resolution, and Asahi Dragon Trail supports the screen. It is scratch resistant and comes with elegant circular edges. The Panasonic ELUGA A3 Pro supports a new operating system to run its software and manage its files well. It is running Android Nougat 7.0. 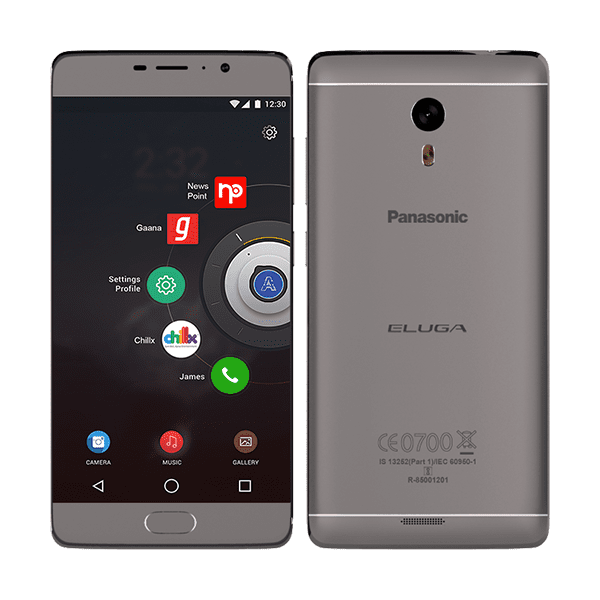 The Panasonic ELUGA A3 Pro works with the 64-gigabyte MediaTek MT6753 processor, the Cortex-A53 Cortex-A53 eight-core processor, and the graphics processor responsible for handling videos and images when viewed on the screen comes from the Mali-T720MP3. The phone supports sensitive sensors, the most important fingerprint sensor on the front of the phone, and the sensor convergence and acceleration and rotation. The phone supports media, vibration, MP3, WAV, external loudspeaker, and earphone input. The camera supports a high-resolution rear camera and multiple features. The camera’s resolution is 13 megapixels, and the rear camera features support for auto focus, geo-tagging, touch focus, face detection. The rear camera supports 1080p video capture, capturing up to 30 frames per second. The front camera supports 8-megapixel imaging, which can capture high-definition images. The phone supports 32GB internal storage, 3 GB RAM and an external memory card support up to 128GB microSD cards. The lithium-ion battery has a capacity of 4000 mA and is removable. The phone was issued in golden and dark golden colours and grey. Runs modern Android Noga 7.0. It works with the MediaTek MT6753, eight-core processor. Supports 13-megapixel rear camera and 8-megapixel front. The internal memory space is right at 32 GB, and the random 3 GB RAM. Supports the use of external memory card up to 128 GB. Supports screen protection layer of Asahi Dragon Trail Glass. The user can not remove the phone battery. Your phone does not support the fast transfer of NFC files. Infrared control does not support IR. Supports Bluetooth Bluetooth 4.0, A2DP. Supports 802.11 b / g / n Wi-Fi networks, Wi-Fi Direct. Supports Wi-Fi Hotspot to connect Internet connection between phones. Supports the A-GPS trending application. Supports HSPA connectivity 42.2 / 5.76 Mbps, LTE Cat4 150/50 Mbps. The most important feature of the Panasonic ELUGA A3 Pro is its shock resistant metal design and the screen layer of the Asahi Dragon Trail glass. For its performance specifications, it is good for Android Noga 7.0 and the MediaTek MT6753 with 64 GB and 8-core architecture, To quickly use and navigate applications. The price of the phone in Egypt is not yet determined, find out the latest price for Panasonic ELUGA A3 Pro in Egypt from here. The price of the phone in Saudi Arabia is not yet determined. Find out about the latest price of the Panasonic ELUGA A3 Pro in Saudi Arabia from here. The cost of the phone in the UAE is not yet determined, find out the latest price of the Panasonic ELUGA A3 Pro in the UAE from here.